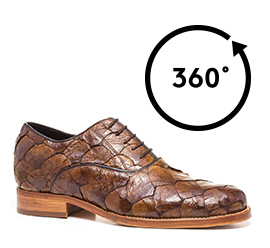 Luxurious and exclusive, "Rua Oscar Freire" are the new dress shoes by GuidoMaggi. Extreme elegance, the result of Made in Italy craftsmanship and technological innovation, combined with the finest piracucu leather, typical of the Amazon region. Rua Oscar Freire represent one of the most unique creation of the new "exotic leather skins" collection Summer 2016. The piracucu skin is extremely rare, appreciated for the peculiar color of its scales. The Upper in soft Piracucu skin, sole and insole in genuine Italian leather, are assembled by hand and sewn at sight. The inner increaser, invisible and anatomic, can be chosen between: 6 cm, 7 cm and 8 cm.